When you think of Europe, typical images come into your mind: Paris and the Eiffel Tower, sipping coffee at an espresso bar in Rome or perhaps enjoying some time on the beach to escape the bustling modern city of Barcelona. Europe’s history is well-known, accommodations are comfortable and currency is collectively easy to manage in your wallet. But of course, these images are all found in Western Europe. I wanted to try something atypical, something unknown. Something more challenging both in terms of culture and comfort. And so I turned my gaze to the East. The unfortunate aftermath of the Allied success in World War II saw Europe divided between the victors, with almost all of Eastern Europe handed to the Soviet Union on a platter. Puppet governments and Soviet sympathisers were installed into power, the gates were locked shut and keys hidden for nearly half a century; what we now casually call the Iron Curtain, was a physical, economical and emotional border that split Europe in two. But at the end of 1989, the will of the people couldn’t be held back any longer – governments were dissolved, free markets were reinstated and borders were opened. 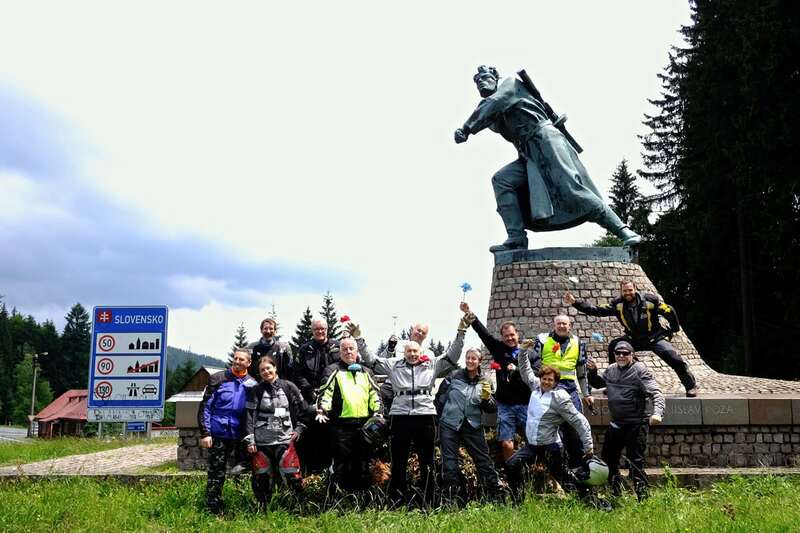 With the help and expertise of Edelweiss Bike Travel I found myself on a brand new tour they had on offer for 2018: Eastern European Delights. This two-week roller coaster started in Vienna, once the easternmost outpost of democratic Europe, and quickly crossed the boundary of the former Iron Curtain into the Czech Republic – the second of eight countries (and six different currencies!) on the tour, all of them but Austria former communist states. 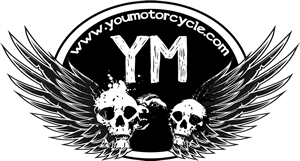 I was keen to explore what was once completely off-limits to those on the western side of the wall, both on and off the motorcycle. 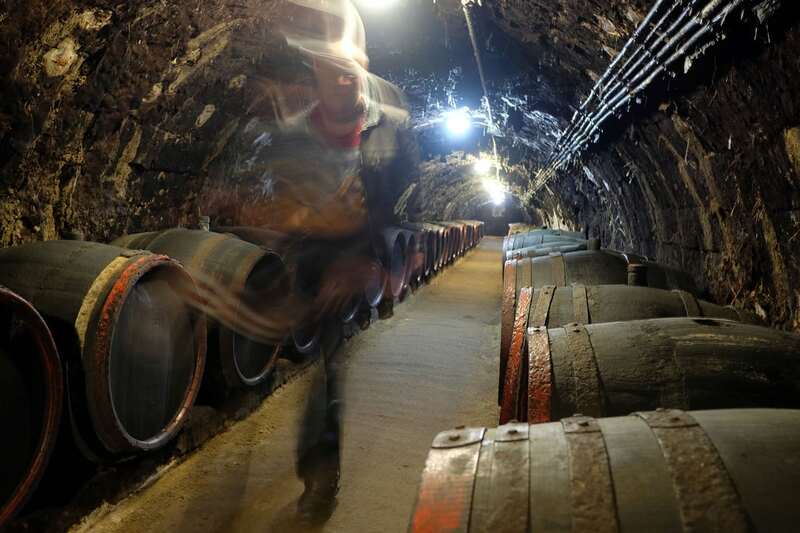 The Czech Republic is perhaps most famous for beer, and I can tell you from experience that it’s damn fine. 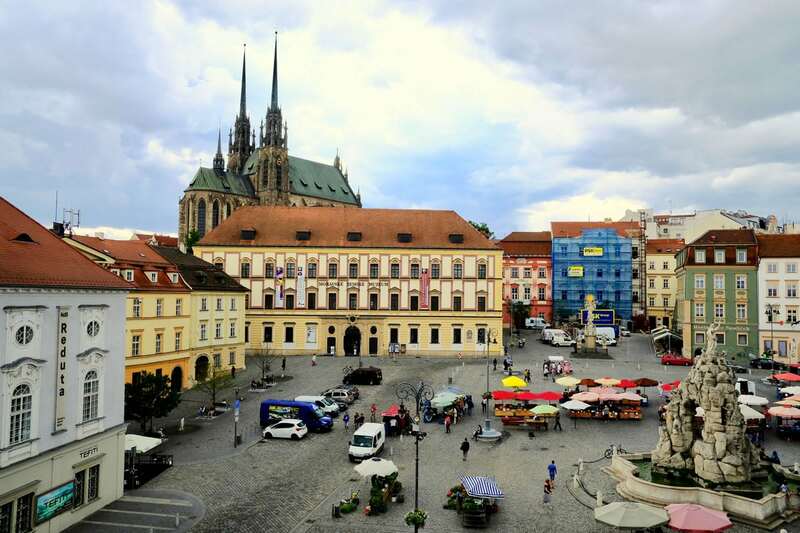 We spent the night in the historic centre of Brno, the Republic’s second largest city. What I quickly came to realise is that beautiful European cities are not only found in the West! Quintessentially European, it was as if the city skipped a chapter in time, with no architectural Soviet influence anywhere to be seen. The large town square plays host to a fantastic local market each day, with farmers selling their produce and artisans their crafts. It gave a fantastic insight into what traditional life might have been like in a medieval city. 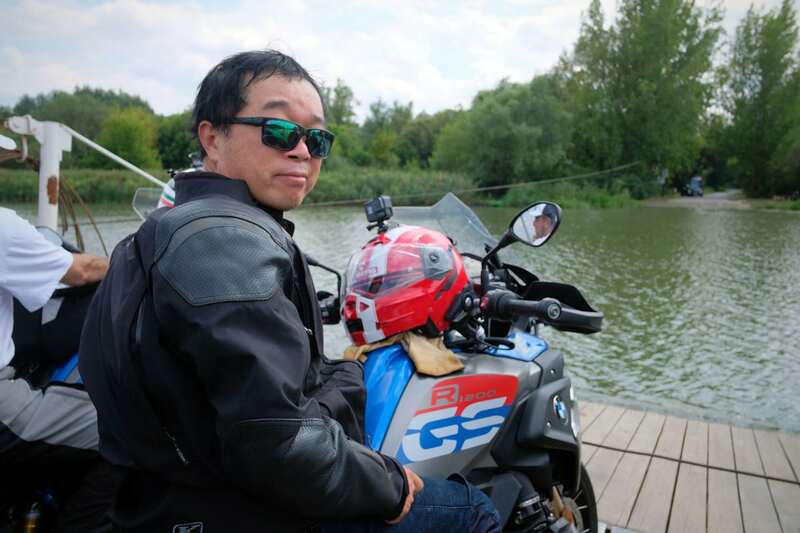 With six more countries still on our list we didn’t have time to linger, and so we rode on via the quiet backroads of Slovakia to Poland’s cultural capital of Krakow. Rolling through the hillsides on beautiful country roads gave us a great opportunity to appreciate what life is like for those less privileged in these remote parts of the continent and especially gave us pause to think about what it might have been like 40 years ago. Along the way we had the chance to visit some incredibly unique wooden churches. These original wooden structures of Lesser Poland were built 300 years ago – without any nails or screws. They have some unbelievable hand-painted frescoes inside, again, all original. The craftsmanship is simply magnificent and reminds you that the history here goes so much further back than our own living memory. In Krakow we spent a day off the bikes to stretch our legs and explore. I had no idea what to expect and it simply blew my mind! Its beautifully preserved old town has the largest medieval square in all of Europe and the hours disappeared, as we made our way towards the Wawel Castle along the romantic cobbled streets. Once the capital of Poland & Lithuania (at the time the largest country on the continent), Krakow was a bustling trading hub with people converging from East and West to buy and sell their wares. This success was ultimately also their downfall, leading to invaders from all corners coming to take their share of the spoils; in fact, for 300 years Poland was literally wiped off the map. 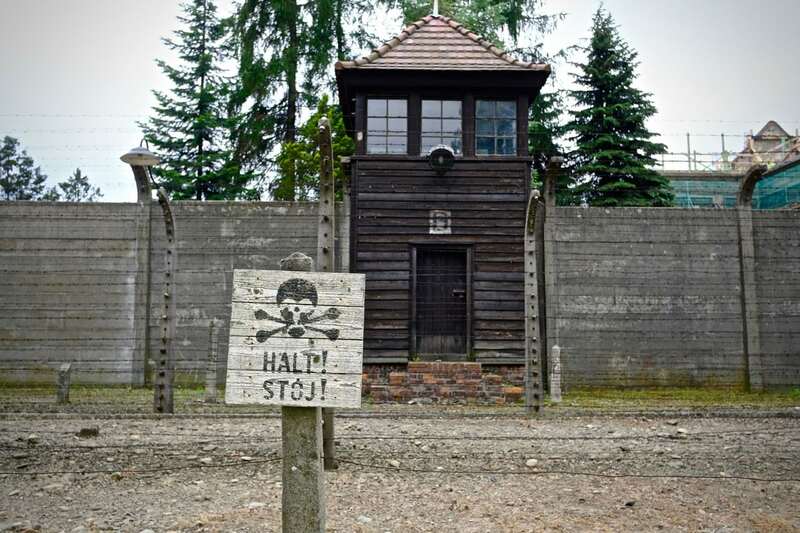 The Polish are no strangers to troubled times, and our tour also took us to the infamous concentration camp of Auschwitz. Words cannot describe the emotions you feel as you walk around this place. 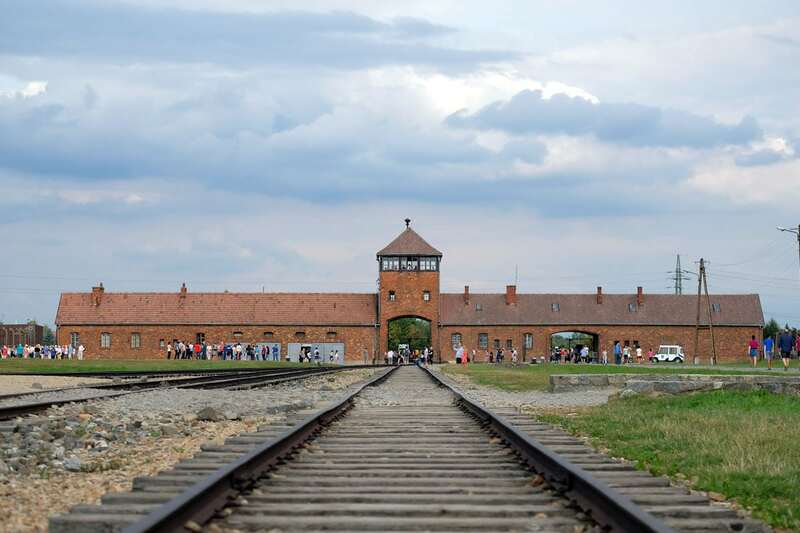 Of course we all know about the things that happened here, but to see it in real life and listen to the stories the memorial staff tell makes for a truly unforgettable experience. After our rest day it was time to head South into the heart of Slovakia, before darting West across Hungary on our way to Romania. We stopped in the viticulturally historic town of Tokaj (pronounced Tokai), where they have been producing a unique style of sweet wine called Aszu since the 12th century. 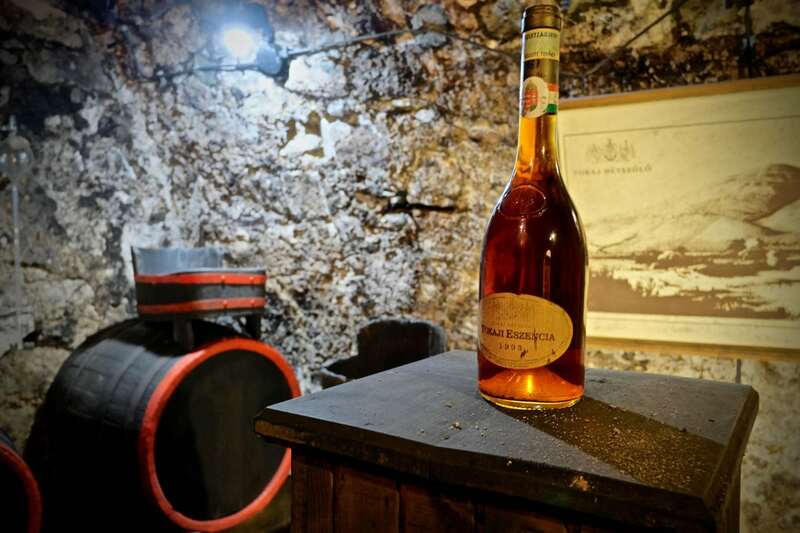 In fact, the grapes of Tokaj have been legally certified and classified since the early 18th century: More than one hundred years before the French started classifying their own wines. Of course, arriving on two wheels meant that we couldn’t sample the wines on the spot, but I did buy a few bottles to take home with me, which my wife was very appreciative of. And finally the moment had come, as we arrived at the border of the most easterly country of our journey: Romania. 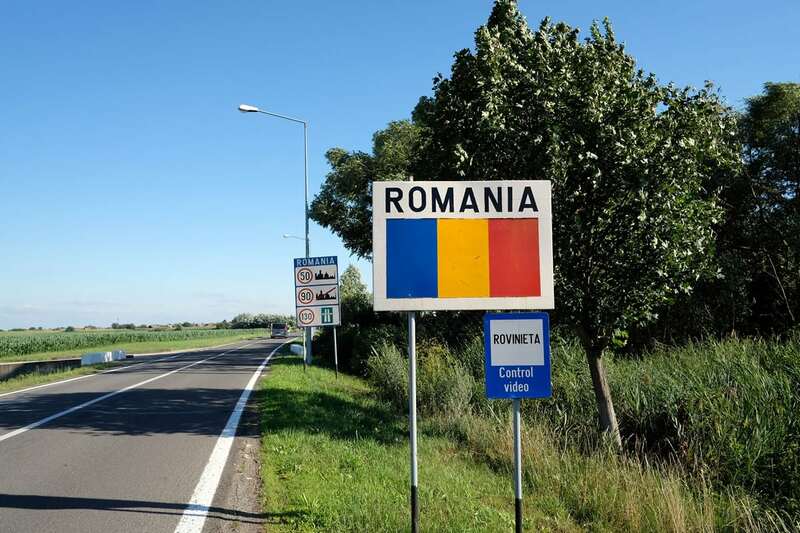 It really felt like we were crossing into a different territory, too; although Romania joined the EU in 2007, it is still not part of the Schengen Zone, so it has formal land borders complete with immigration and customs control. All of our previous border crossings were simply sentimental affairs, as checkpoints had long been closed down, but entering Romania was a one hour ordeal. 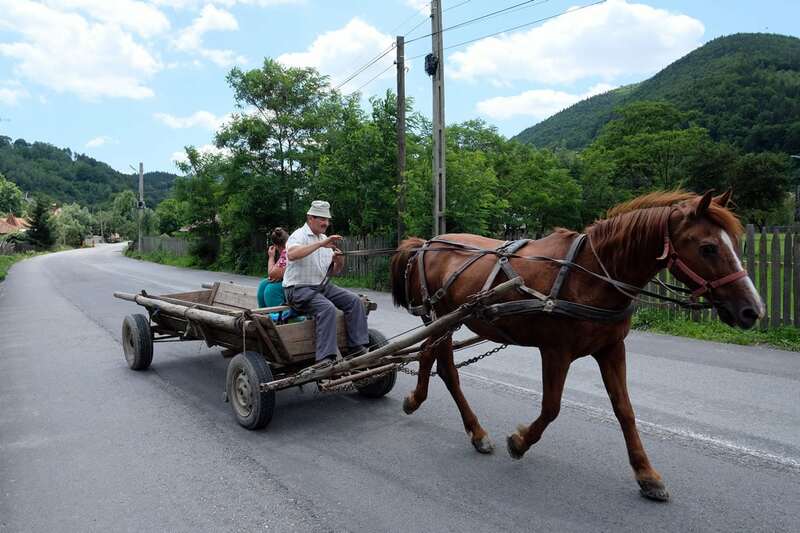 It would be reasonable to say that Romania still has some catching up to do with it’s westerly neighbors; their economy is not as strong and as a result the quality of life is harder for the common people. Even on major roads a regular sight is still horse-drawn carriages, although they have been modernised to the point of having car tyres! I couldn’t help but spare a thought for the horses trotting up and down these roads. A lesser quality road in Romania, thankfully they weren’t all this bad! 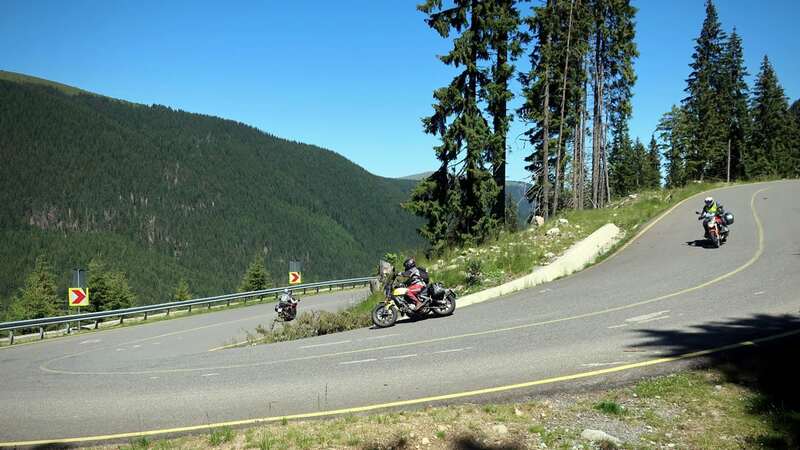 The condition of the roads themselves is so widely varied, it’s hard to summarise the riding. Some roads were so bad that it might have been easier if they were completely gravel, but on the other hand some were of race track standard. 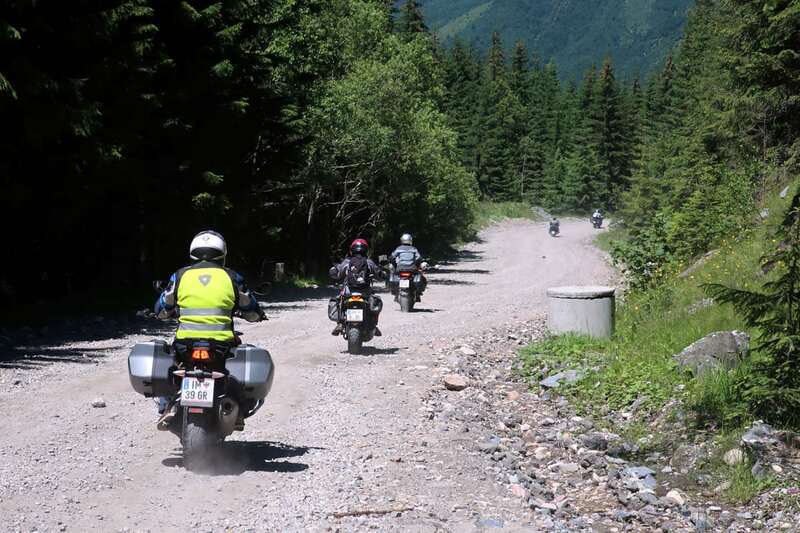 The riding highlight of the entire tour was to be the Transfagarasan – a 90km long engineering masterpiece crossing the Carpathian Mountains from North to South, built by the communist government of the 70s as a strategic military road. Described by Top Gear’s Jeremy Clarkson as “the best road in the world” it would be fair to say that I had high expectations. The road surface has deteriorated since the team from Top Gear came tearing through with their supercars, but that didn’t make it any less spectacular. 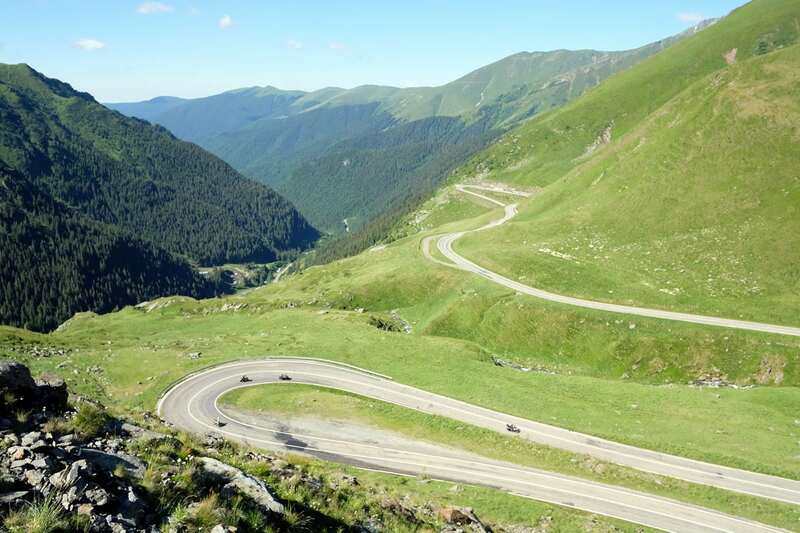 The view from the summit over the switchbacks into the Fagaras valley certainly takes your breath away – one member of our group simply couldn’t stop laughing – he was so overwhelmed with the experience of riding up such an incredible road. But what goes up must come down as they say; we still had another 80kms of fantastic riding to get down to the plains on the other side. 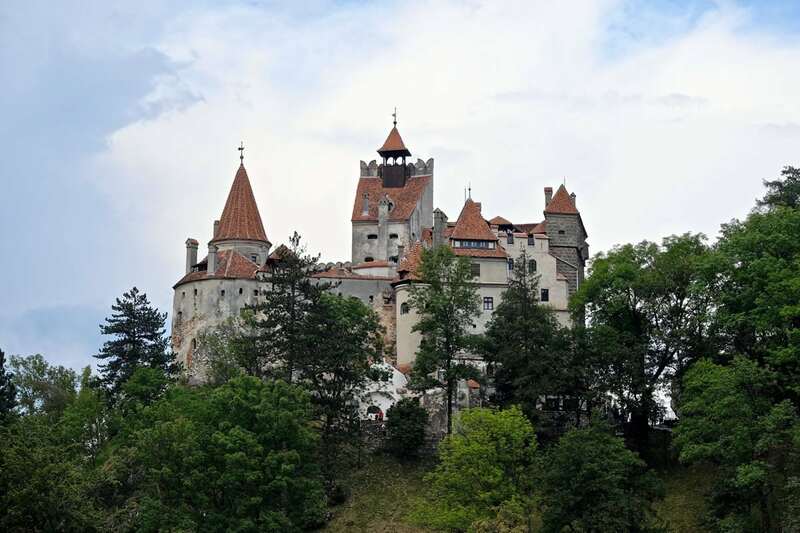 Bram Stoker’s hugely successful novel Dracula was inspired by Bran Castle and that was our next stop, after which we spent the night in the historic town of Sibiu. 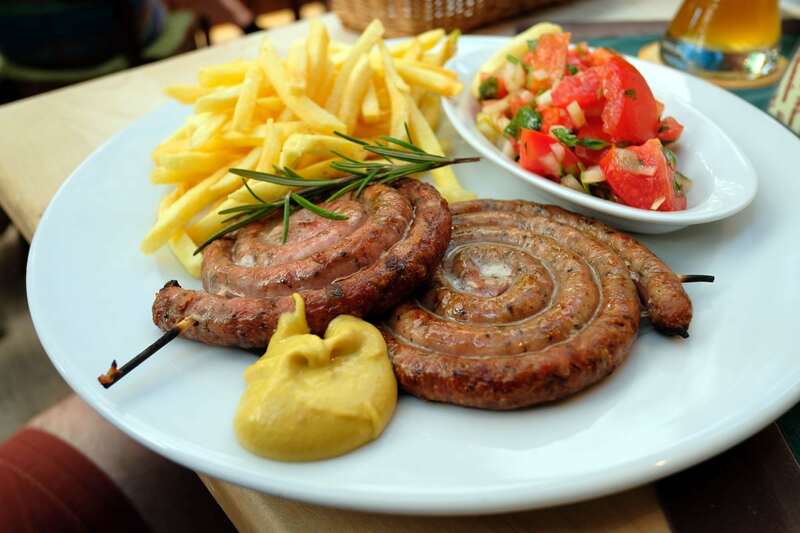 Our last night in Romania was in Timisoara, where we were really able to appreciate the hospitality and fine produce Romanians are famous for. 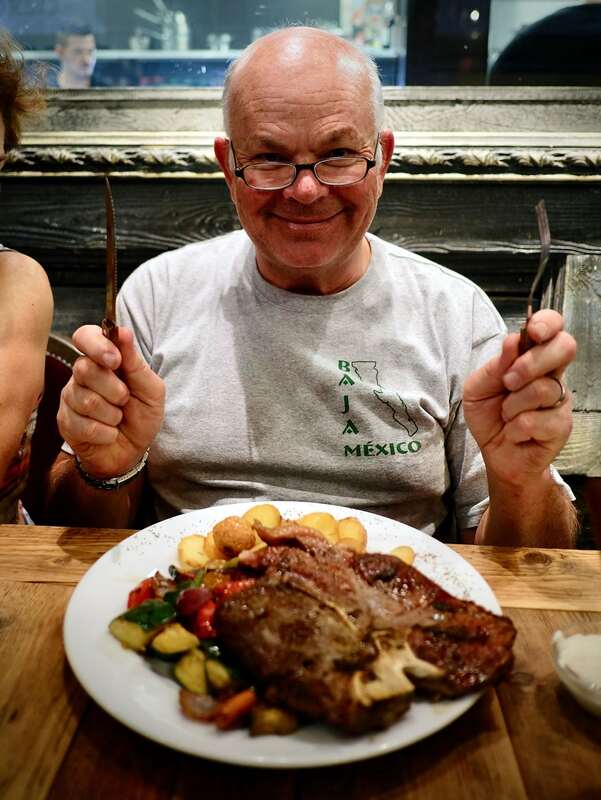 We were served a dinner fit for a king, all whilst keeping a watchful eye over the motorcycles and it was a great way to farewell the country. Leaving Romania our tour changed direction from East to West and we crossed the border back into Hungary with the same logistics that were required for our entry. 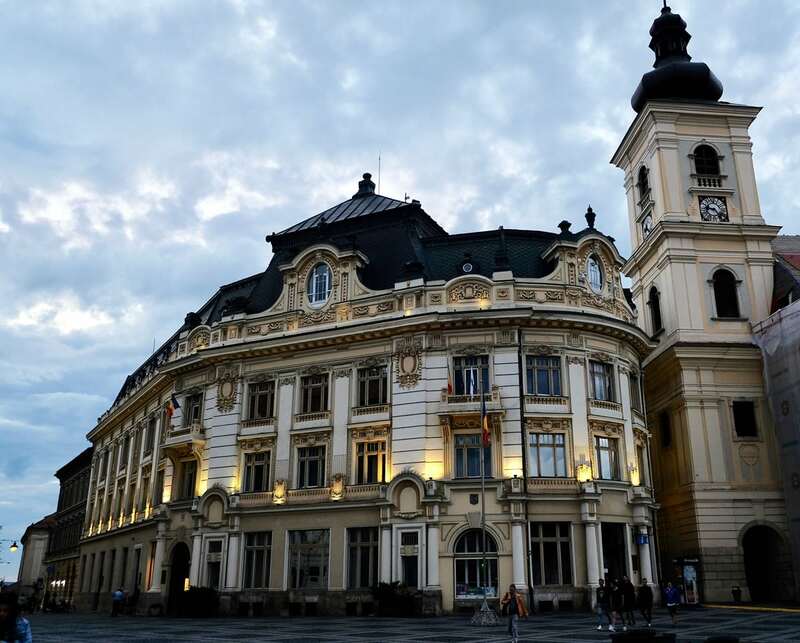 We spent a night in the largely unspoiled city of Pecs (pronounced Pech), where we had the opportunity to explore the old town and enjoy a great dinner right in its centre. The fifth largest city in Hungary, Pecs, is a university town which escaped WWII and communist re-development largely unscathed. This made it fantastic to walk around and soak up the authentic atmospheres. 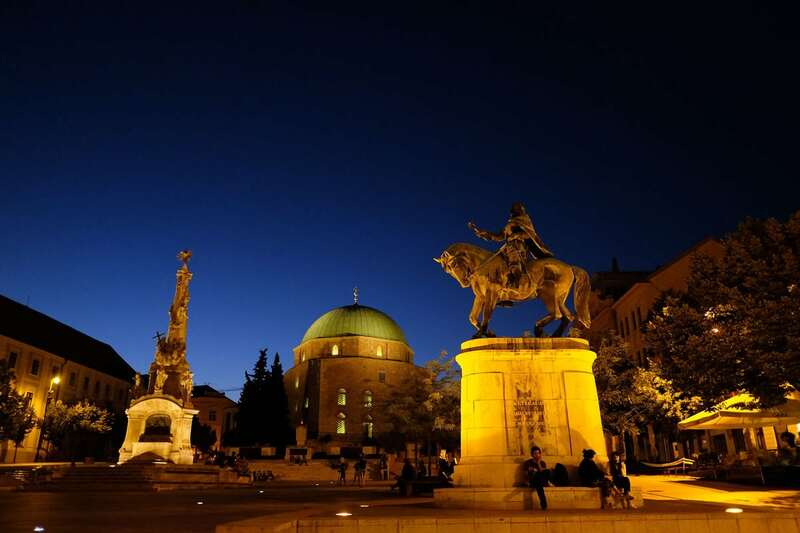 Continuing westward, we crossed from Hungary into Croatia, our sixth country for the tour. Literally just passing through for the day we crossed the border into Slovenia that same afternoon. You really get an appreciation for how geographically small Europe is when you travel by motorcycle through three countries in a day. 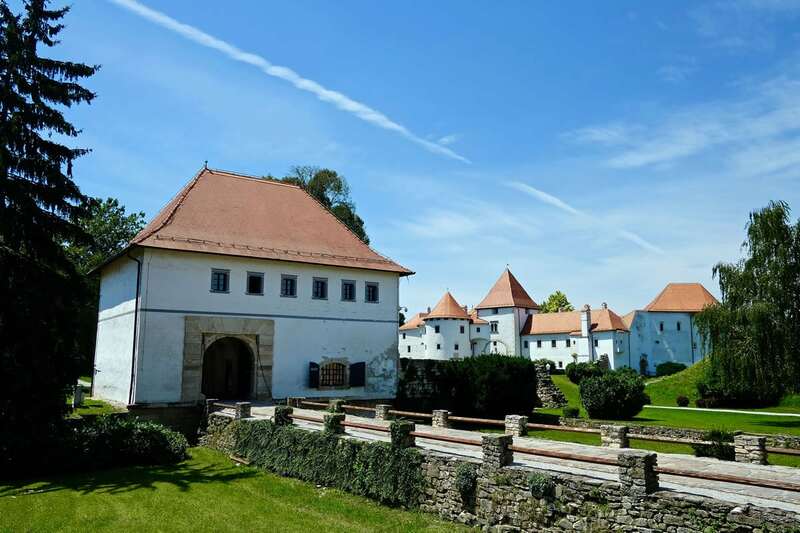 Not without its sights though, we enjoyed a great lunch in Varazdin, a sleepy but traditional city in northern Croatia that was once the capital of the entire country. 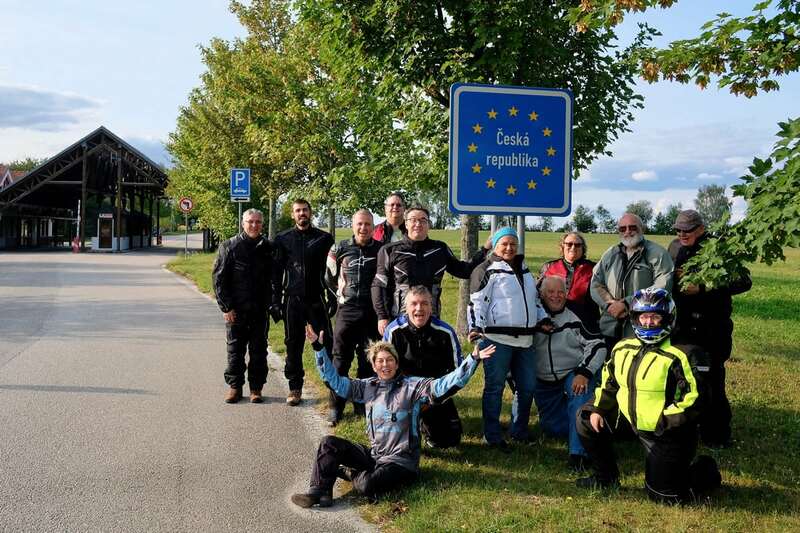 After resting our heads in Maribor, Slovenia, we made our final border crossing into Austria and back to the western side of the Iron Curtain. 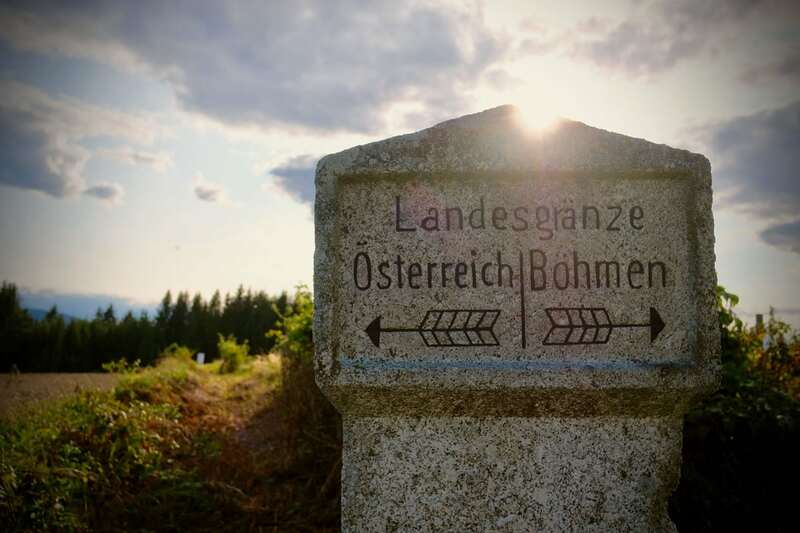 Although the former communist states have come so far in the last 30 years, you still can’t help but feel like the bar is raised when you cross into Austria. 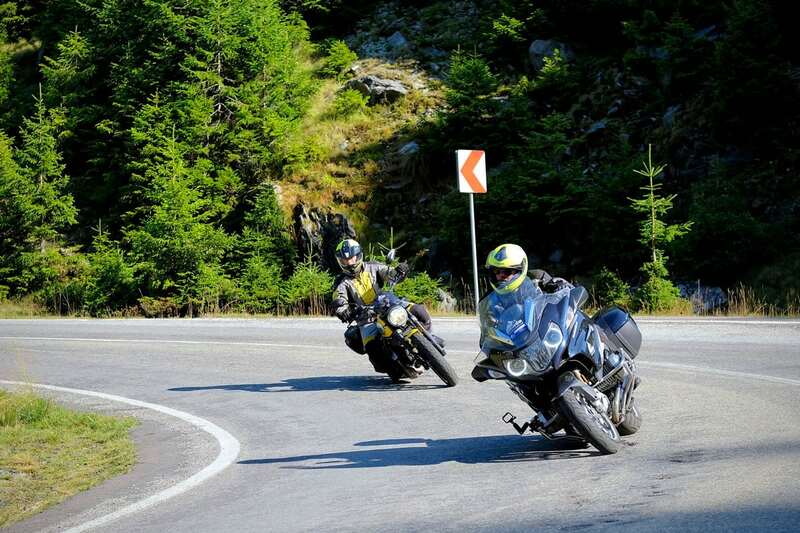 The road infrastructure is second to none, and given it’s largely mountainous terrain, it’s a paradise for riders. 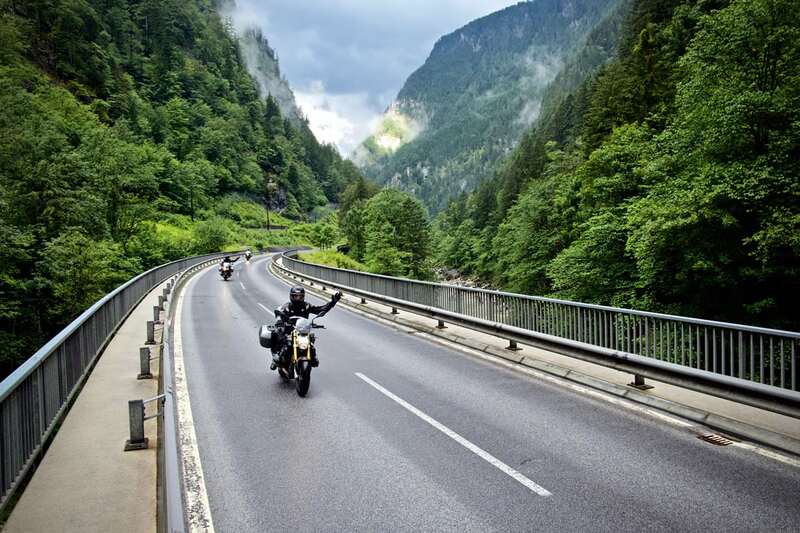 Seemingly endless curvy roads through picture perfect valleys are what you can expect when riding through Austria, and it was a fantastic way to end what was already a great two weeks of touring. A particular highlight was the visit to the Erzberg mine, where the infamous Red Bull Hare Scramble is held each year. 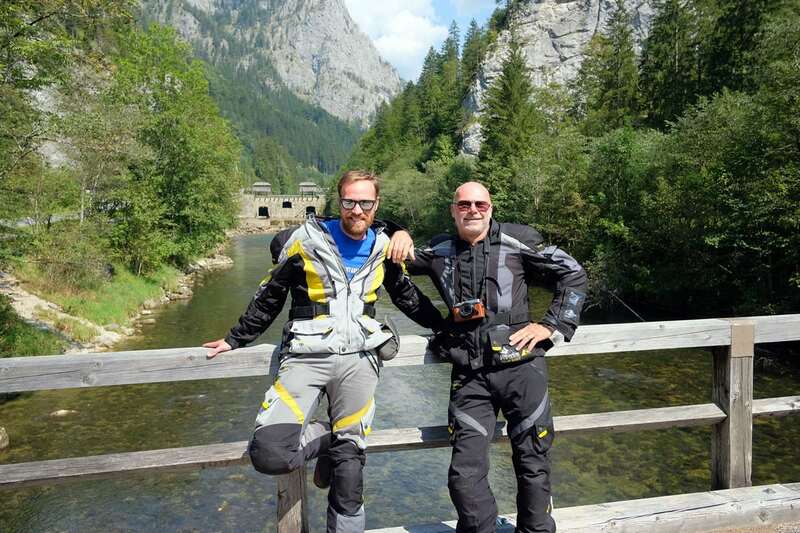 It’s not often that you feel like you have a greater understanding of the world as you roll towards the end of a motorcycle tour, but as we made our way back to Vienna after a fortnight behind the Iron Curtain, I felt I’d experienced first-hand a tangible part of modern history that was previously just a distant memory from TV news reports. 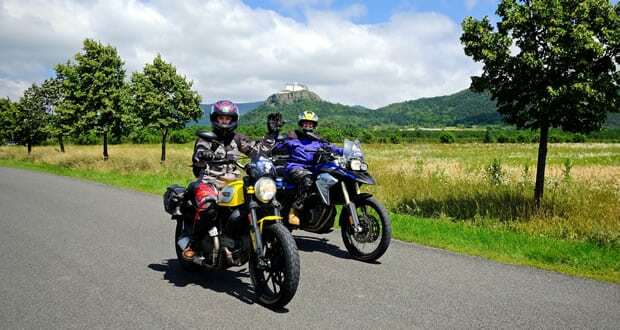 The great thing for us both as motorcyclists and tourists is that these countries are now accessible, affordable and safe – they offer a great chance to broaden our horizons, not to mention hone our riding skills. 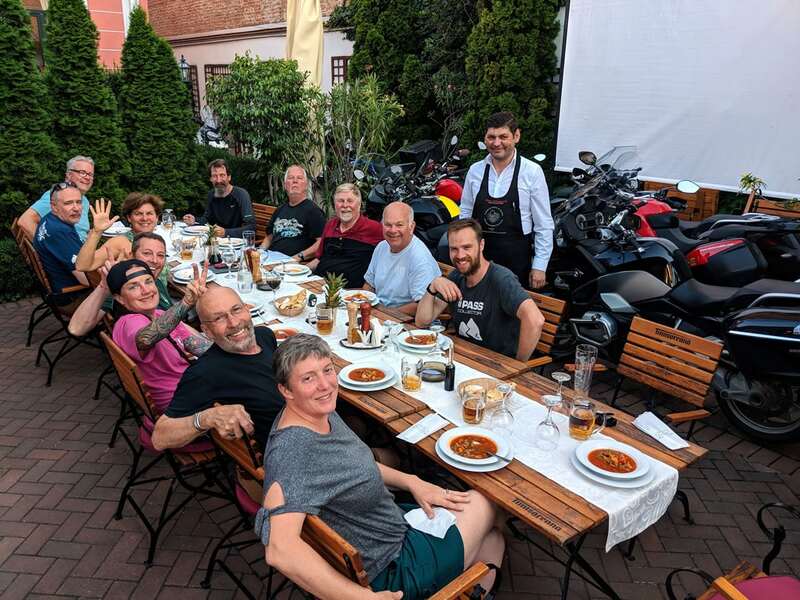 For anybody looking to tour Europe, but break the tourist mold at the same time, I couldn’t recommend more highly the Eastern European Delights tour from Edelweiss Bike Travel. 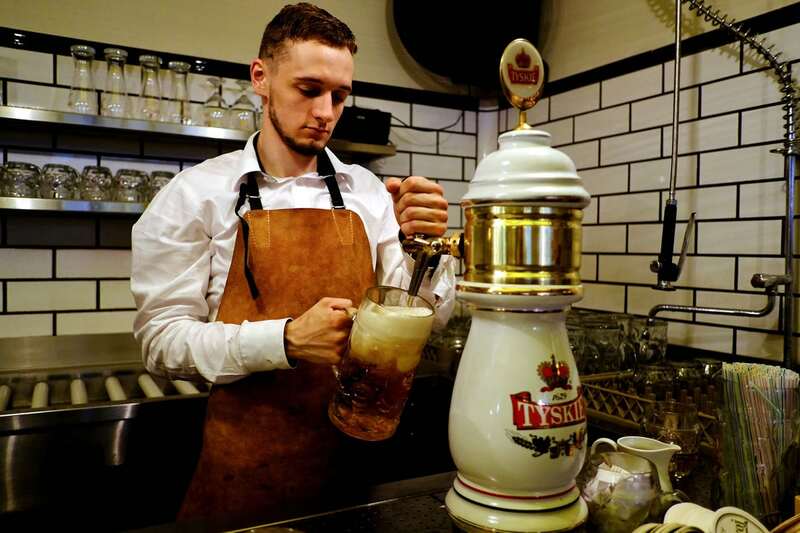 You can find out more about the Edelweiss Easter European Delights tour here, or check out the Japan tour or Ireland tour.